There are a few special occasion foods that are emblematic of my childhood. For birthdays, my mom would dredge and pan-fry thin, expensive fillets of dover sole, or pound out rounds of cutlets for veal scallopini. The common thread for all of these special occasion foods seemed to be that they required just a bit too much time and a bit too much butter to be every day meals. So it’s no surprise that hollandaise sauce topped the list as the most rare and crave worthy dish of any holiday. My mother learned hollandaise sauce from her mother, who didn’t cook much, but whose nature dictated that when she did, it would be something as ambitious and difficult as this egg and butter emulsion. Like mayonnaise, the trick to this sauce is using the egg to marry the butter and lemon juice, two ingredients that would ordinarily prefer to stay in their own lanes. 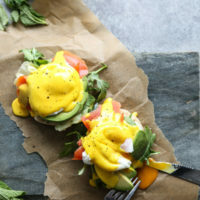 But Hollandaise sauce poses an even more challenging problem than simply making sure the sauce doesn’t “break,” meaning coagulate into an unappealing lumpy, greasy mess. With this mother sauce, you have the added element of temperature control: warming the butter helps partially temper the egg into a smooth, creamy custard. To accomplish this, I use the modern-day cheat: a high-speed food processor, which warms the egg and swiftly incorporates the stream of hot butter. The aggressive blades pretty much ensure that the sauce will emulsify, and you can keep blitzing it so that it doesn’t form a skin on the top as it cools. Back in the day, however, in the kitchens of mothers’ past, this mother sauce required a double boiler, a swift whisking hand, and a lot of confidence. My mother had all three. My grandmother, however, mostly got by on the third ingredient. After becoming crippled by polio from the waist down at the age of 26, my grandmother mostly got around by way of crutches. How she managed to walk at all, is still a mystery. But she did so many ordinary, everyday activities that I never stopped to question the physics of them. Up until her 80’s, she drove a normal car, using the highly unsafe technique of crossing her feet and using a twisting of her hips to press the petals. She played croquet and always won, sending my cousins balls flying into the bushes and them sobbing after them. And she made Hollandaise sauce, a task that should normally require two working hands and legs, but for her just necessitated the same sheer will that she put into everything else. 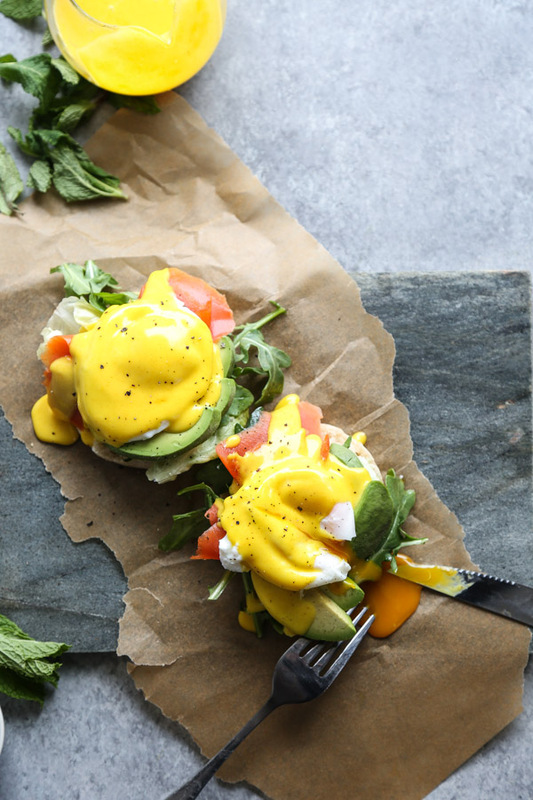 Since Mother’s Day is coming up, I thought it would be the perfect time to share my own healthified version of Hollandaise sauce, which I’ll admit, I didn’t have the nerve to make until very recently. What I lack in confidence and will handed down through my maternal bloodline, I usually make up for in creativity. 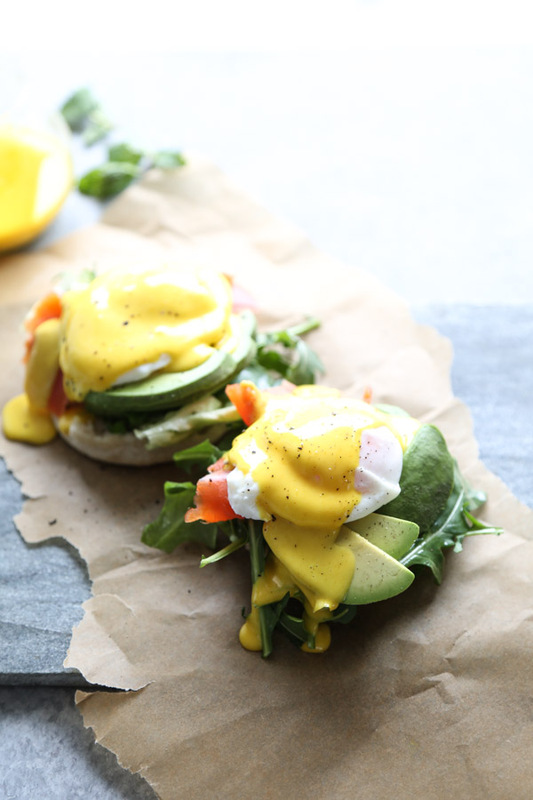 And in the case of this easy Hollandaise, I work smarter, not harder by way of the blender. The base of this sauce is ghee instead of butter, which adds a lovely nutty flavor and is a great option for those who are sensitive to dairy. 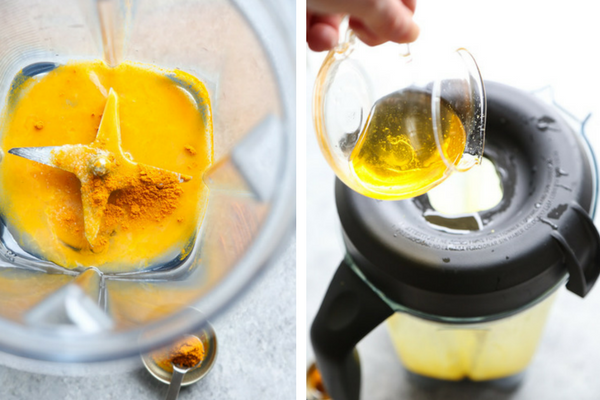 It’s also punched up with anti-inflammatory turmeric, which gives the egg yolks an extra layer of sunshine. 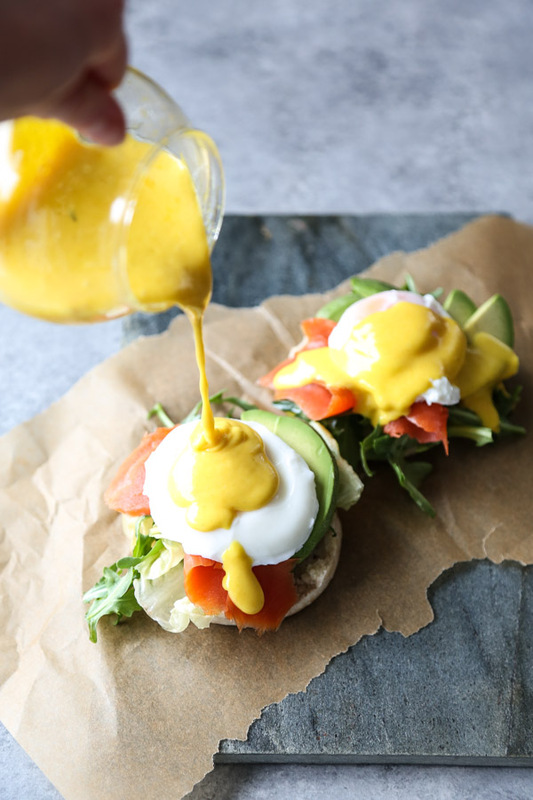 Together with the avocado and smoked salmon, this ghee hollandaise forms a trifecta of healthy fats. 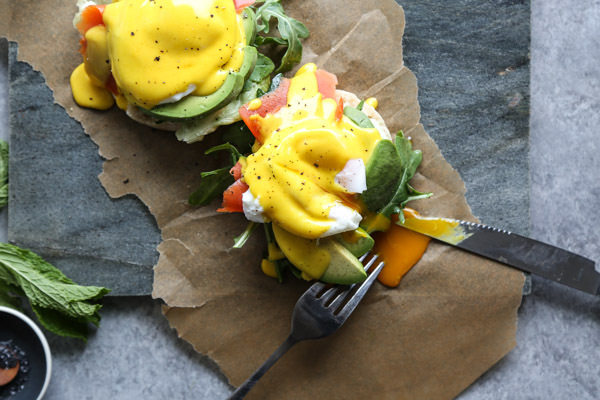 I’ve always wondered what Keto people eat to get so much fat in their diet, but I think I now know that the answer is this Paleo Eggs benedict recipe for breakfast, lunch and dinner. To make the bun paleo, I’ve listed a few suggestions in the recipe. I used GF English muffins, but you can also make your own spiralized veggie buns or go the lettuce wrap “naked” route. 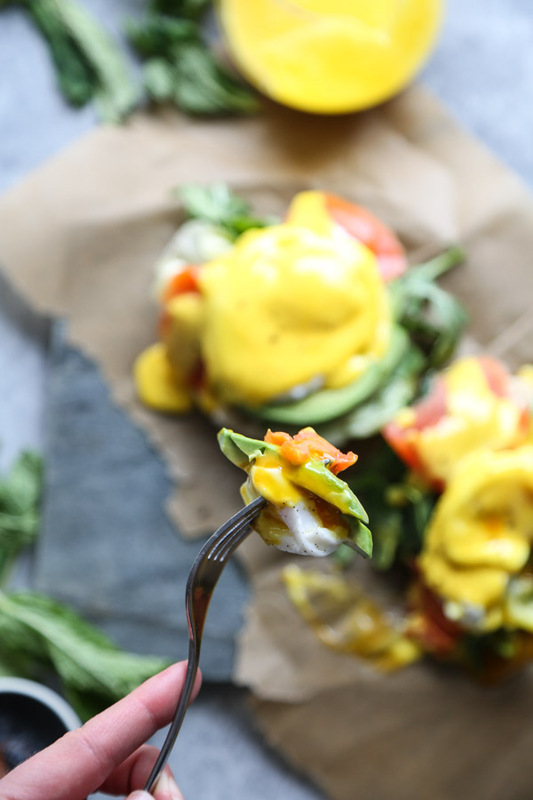 Either way, if you’re looking for a special occasion food that’s worth the extra effort, but doesn’t require all the extra butter, this easy hollandaise sauce is the perfect gift from my mother (and her mother) to yours. 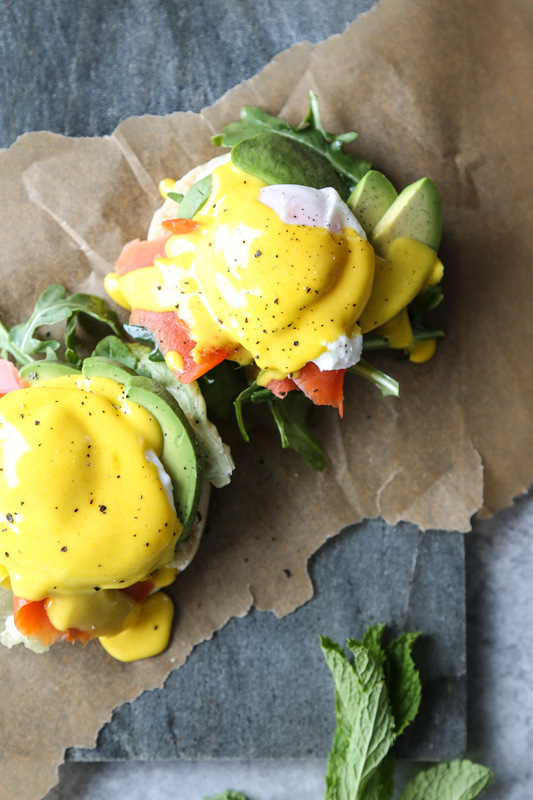 This easy eggs benedict is topped with a paleo hollandaise sauce that will blow your mind. 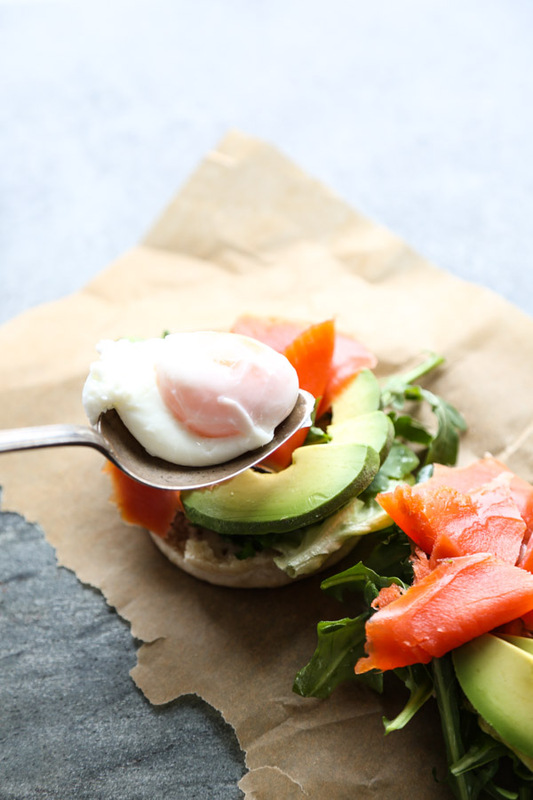 Top the whole thing with smoked salmon and avocado and you have a home run recipe. Heat a large saucepan of water on the stove until just shy of a simmer. 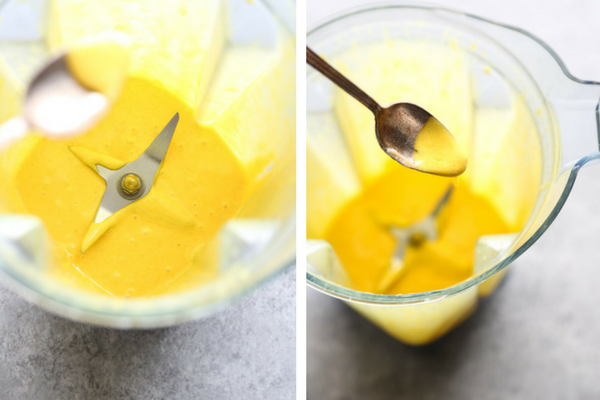 Make the hollandaise: Using a heatproof bowl in the microwave or over a double boiler, melt the ghee until warm to the touch. Meanwhile, add the egg yolks, lemon juice, salt and turmeric to the bowl of a blender. Puree until combined. With the cap off the top and the blender running on medium, slowly stream in the hot ghee. Begin with just a few drops and slowly add the rest until fully incorporate, thick and creamy. The hollandaise should easily coat the back of the spoon but be looser than aioli. Taste for seasoning and add more salt or lemon juice as necessary. Set aside in the blender until ready to assemble, as you may want to pulse again before serving if a skin forms on the top. Poach the eggs in your gently simmering water using your favorite technique. Mine is this control freak method, but it takes a little longer. Transfer the poached eggs to a towel-lined plate. Toast or reheat your buns or English muffins, then begin assembling the benedict. In a medium mixing bowl, toss the mixed greens with the lemon juice, olive oil and season with salt and pepper. 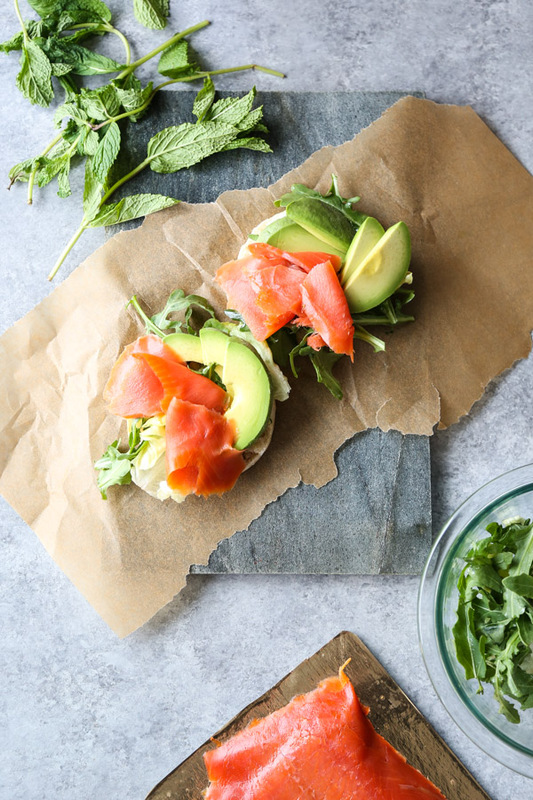 Top the buns with a small handful of greens (any extra can be served on the side), followed by the sliced avocado and salmon. Top with the poached eggs and drizzle with the hollandaise. Season with salt and pepper and serve immediately. These paleo parsnip buns are a perfect base for this benedict. These English muffins work well too. You can always use a potato wedge as well or serve them naked without any bun at all. I love the story behind this recipe. It’s a beautiful example of how food nourishes much more than just our bodies. Thanks for sharing! Would coconut oil work in place of the ghee? In this case, I would stick with ghee.